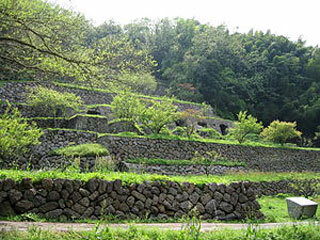 The Iwami Ginzan Silver Mine in the south-west of Honshu Island is a cluster of mountains, rising to 600 m and interspersed by deep river valleys featuring the archaeological remains of large-scale mines, smelting and refining sites and mining settlements worked between the 16th and 20th centuries. The site also features routes used to transport silver ore to the coast, and port towns from where it was shipped to Korea and China. The mines contributed substantially to the overall economic development of Japan and south-east Asia in the 16th and 17th centuries, prompting the mass production of silver and gold in Japan. The mining area is now heavily wooded. Included in the site are fortresses, shrines, parts of Kaidô transport routes to the coast, and three port towns, Tomogaura, Okidomari and Yunotsu, from where the ore was shipped. This article uses material from UNESCO World Heritage List article "Iwami Ginzan Silver Mine", which is released under the Creative Commons Attribution-Share-Alike 3.0 IGO License.